04/13/2019 - The Hershey Bears announced today that the club has recalled defenseman Joey Leach from the South Carolina Stingrays of the ECHL. Leach, 27, returns to Hershey after skating in 17 games with the Bears earlier this season, registering one assist, six penalty minutes, and a +1 rating. 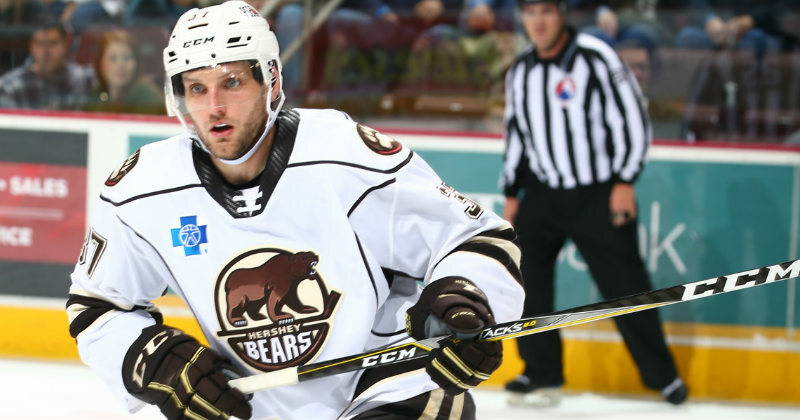 Leach joined Hershey on a professional tryout agreement on Dec. 18 after skating on an AHL deal with the Bears during parts of the 2015-16 and 2016-17 seasons. Hershey signed Leach to an AHL deal for the remainder of the 2018-19 season on Mar. 14. The 6-foot-4, 205-pound Saskatchewan native played in 38 games with the Stingrays this season, scoring 28 points (three goals, 25 assists), adding 65 penalty minutes, and a +11 rating. Leach, South Carolina's captain, also played in two playoff games with the Stingrays. He has appeared in 303 career ECHL games, tallying 118 points. The Bears return to action tonight as they host the Utica Comets at 7 p.m. at Giant Center. It's Dietz & Watson Ham Shoot Night as all fans are invited to the ice after the game for a chance to win a holiday ham. .